This is the PERFECT appetizer for your next holiday party! This creamy, savory spread is made with vegetables, herbs and seeds that have been baked golden, then mixed with sweet dried cranberries and covered with nutty almonds! Spread it on a buttery cracker for a taste and texture explosion! I love plating dishes, so putting this beautiful dish together is so much fun! This creamy, savory spread is made with vegetables, herbs, and seeds that have been baked golden, then mixed with sweet dried cranberries before being covered with crunchy almonds. Spread it on a buttery cracker for a taste and texture explosion! Peel and chop the potato, carrot, onion, and celery into large chunks. Place the chopped veggies, garlic, 11/2 cups/355 ml of water, and the remaining ingredients, except the cranberries, in a food processor. Process until smooth. Make sure to scrape down the sides. Pour the mixture into an oiled 11 x 9-inch/29 x 23 cm baking dish, and make sure it’s in an even layer. Bake at 350ºF/180°C for an hour, or until the mixture is fluffy and the liquid is absorbed. Spoon the spread into a large bowl and add the chopped cranberries. Mix well and then cool for 30 minutes or more in the refrigerator. This mixture will make three small or two large pinecones. Take a big handful of the mixture and shape it into a pinecone, with one pointed end and one rounded end. Place it on a plate, making sure to leave room for the rosemary sprigs. Repeat for your other pinecones. 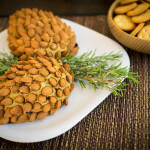 Starting at the tip of your pinecone and working your way from the tip to the back, place the almonds close together on the mixture, with the pointed end of each almond facing the pointed end of the pinecone. 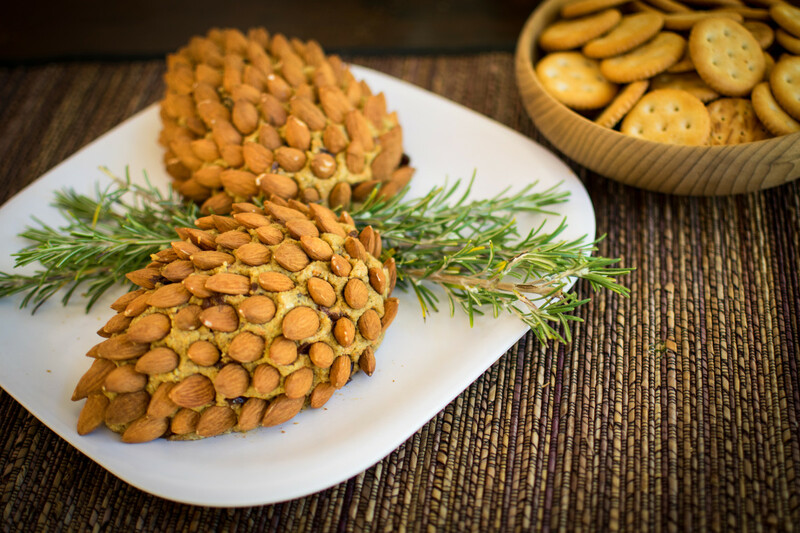 Place the rosemary sprigs around the pinecones, and serve with crackers.